Once in a while I would reconnect an external drive I have to my computer which contains all the digital pictures I have collected over the years and browse on some of the files. And the picture below is one of the lucky files today. A picture of a snowglobe I created 8 years ago. And the snowglobe has a permenent spot in my cabinet. After the high school reunion I attended in Feb 2010, I went to Los Angeles, California in September of the same year and spent a weekend reuniting with 2 other high school classmates who did not make it to the high school reunion. It was a real blast and so much fun that the days just went by so quickly. One Saturday I needed some green foams for a flower arrangement and so I went to a 2-dollar shop but ended up buying an empty snowglobe instead. Went home to find the picture taken in a park in LA. I was thinking it would look very well in a snowglobe and indeed it does. Just look at my snowglobe. 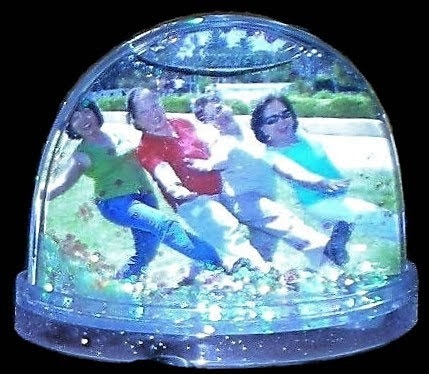 A 2-dollar snowglobe treasure of me and my high school classmates in an LA park.